Matt's Bike Blog: Put A Lid On It - Should Helmets Be Compulsory For Cyclists? Put A Lid On It - Should Helmets Be Compulsory For Cyclists? Last week the Transport Minister responsible for cycle safety, Norman Baker MP, reignited a simmering argument about the wearing of helmets by cyclists. 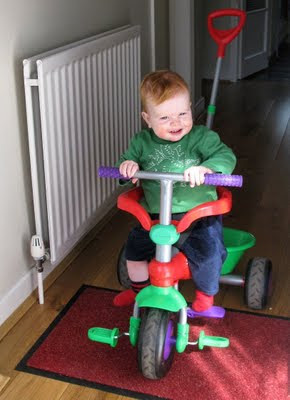 "I don't wear a helmet when I cycle," he said. "I don't want to wear something on my head. For me the joy of cycling is to have the wind in your hair, such as I have left...I'm not encouraging people not to do this, I'm just saying I make a decision not to." The same libertarian sentiments were put forward by London Mayor Boris Johnson before he took office - and people say similar things about not wearing condoms because - 'It just doesn't feel the same'. 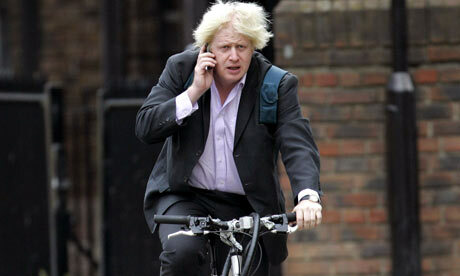 Going for the double - Boris Johnson minus helmet and on his mobile phone! To declare a personal interest, I decided to start wearing a cycle helmet 18 months ago. Despite cycling thousands of miles per year, including a daily commute through central London and from Land's End to John O'Groats, I've always resisted. Who wouldn't chose the feel of fresh air and the sun on your face over the stifling feeling of a helmet, not to mention the pad marks on your forehead? What made me change my mind? Well, at the time my wife was pregnant with our son, Oscar, who's now 14 months old. And while I was happy to take the chance of having my head bashed in when the only person being harmed would be me, it felt different knowing I would be responsible for someone else. But why should I, or 'busybody' safety campaigners, deny the rights of people to risk their own brain injuries? With 2,500 cyclists killed or seriously injured on Britain's roads in 2010, the vast majority through head injuries, is it right for government to act (as it is in Northern Ireland) against the wishes of - but, arguably, in the interests of - recalcitrant helmet wearers...? And what about the costs - both financial and emotional - of the resulting injuries to the individual and their family, as well as their employer, the NHS and society as a whole? Setting aside the philosophical discussion, there are questions about the effects - and effectiveness - of wearing cycle helmets. Research by Dr Ian Walker suggests that motorists give less clearance to cyclists wearing helmets and anecdotal evidence appears to suggest that helmet-wearing may give some cyclists a false sense of security, leading them to take more risks. A law to make the wearing of helmets compulsory in Australia is reported to have led to a 30% drop in the numbers of people cycling. And while many authorities quote an 85% reduction in the risk of head injury through wearing a helmet, those figures are unproven and disputed. Having said that, I have two friends who owe their lives to their helmets and Olympic rower James Cracknell narrowly avoided fatal injuries while cycling across America thanks to his. At the end of the day this must come down to personal choice. I've made my choice and others - such as the Transport Minister - have made theirs. But perhaps, as with the introduction of car seat belts and the increasing social stigma around drink driving, these things will change of their own accord - both David Cameron and Boris Johnson started wearing helmets when they came into the public eye as leaders, for example.